Research on industrial use of carbon fiber has come to the Interbay area of Seattle with a new geeky museum and laboratory in a nondescript building. Seattle has some pretty geeky museums, but a new one opening up in Interbay — the partly industrial area between Queen Anne and Magnolia — will raise the bar. It might also become a pilgrimage site for some visitors, if they can find it. 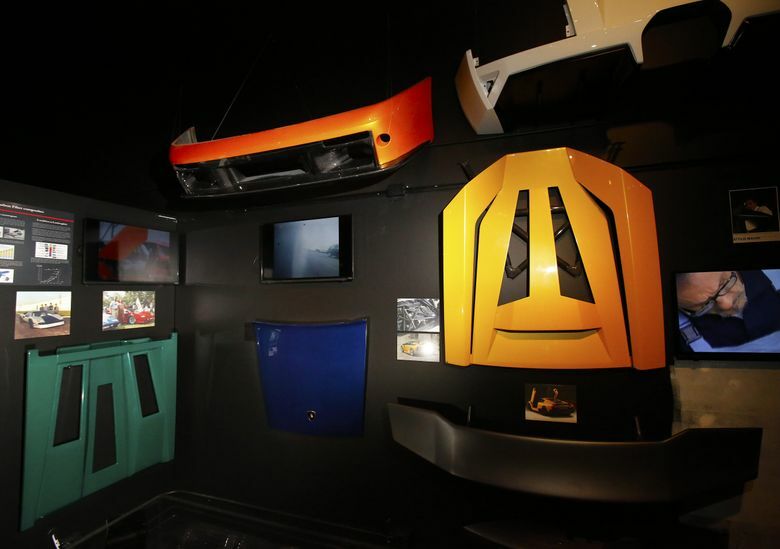 The museum, hidden inside a nondescript warehouse near the train tracks, is part of Lamborghini’s Advanced Composite Structures Laboratory, a research program formerly based at the University of Washington. For a guided tour of the museum, email museum@lambolab.org. Or for more information about Lamborghini’s Advanced Composite Structures Laboratory in Seattle, visit www.LamboLab.com. It’s not another car museum. Instead, it presents the evolution of carbon-fiber materials and manufacturing techniques that Lamborghini developed in Italy and Seattle and now uses to make its cars faster, lighter and more fuel efficient. The museum won’t be complete for another month or two and doesn’t even have a sign on the building yet. So far it includes bits and pieces of all sorts of Lamborghinis, including carbon components of production models, prototypes and show cars. Its glorious centerpiece will be an especially rare model — one of a handful of ultralight, ultrafast Sesto Elemento models that debuted in 2010. They were made largely to showcase a “forged” carbon-fiber production technology developed at the UW. Its name translates to “sixth element,” referring to the atomic number of carbon. Altogether this is one of the sexier examples of globalized innovation — if you’re turned on by exotic materials, advanced manufacturing and fire-breathing supercars. It also shows how the spread of Seattle’s technical know-how can produce unexpected dividends. 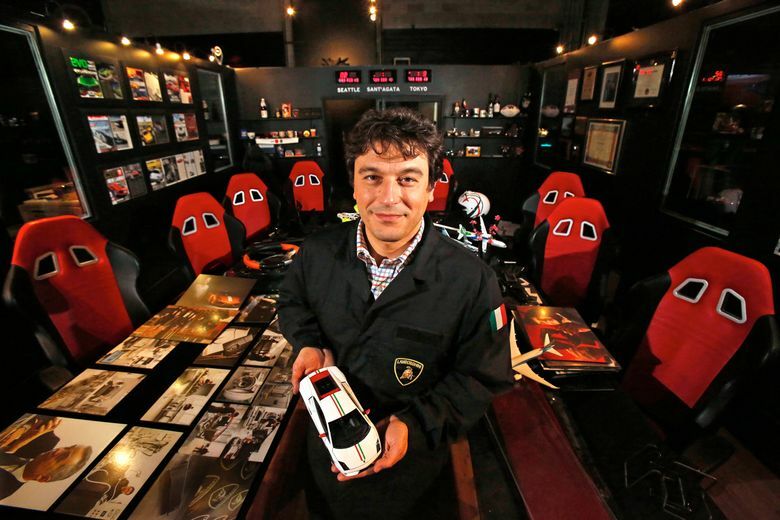 It all began in the early 1980s when Boeing engineer Rosario Vizzini returned to his home country to work at Lamborghini, where he helped it start using lightweight, composite materials. That led in 1983 to a prototype Lamborghini Countach made of carbon-fiber material. Since then, Lamborghini steadily has increased the amount of carbon fiber used in its cars, improving their performance by reducing their weight. The company came back to Seattle in 2007 and formed a partnership with a UW aeronautical-engineering professor, Paolo Feraboli. Feraboli worked at Lamborghini earlier in his career and later with Boeing on the development of its carbon-fiber 787. With Feraboli as liaison, Boeing and Lamborghini collaborated on materials work. Lamborghini also gave millions to the UW to create a materials research and testing lab led by Feraboli. Feraboli’s work includes the development of a cloth-like carbon-fiber material that can substitute for leather on car interiors and the technique for “forging” carbon-fiber composite material, enabling them to be made faster and with less labor. “In the future, that’s going to be the No. 1 technology for the company,” he said. 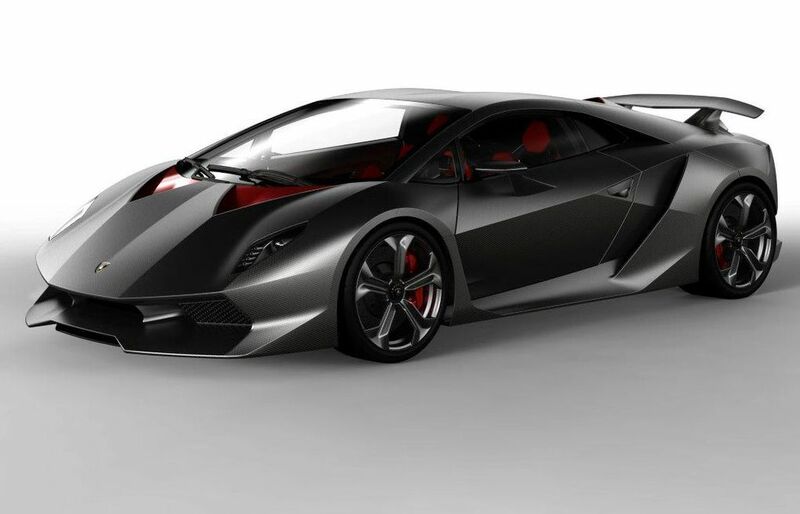 Forged composites were used to make the Sesto Elemento and the monocoque body of the Aventador, Lamborghini’s current flagship. It used to cost $80,000 to $140,000 to build the “tub” foundation of a carbon-fiber supercar, Feraboli said. With the new technique developed in Seattle, Aventador tubs are produced for a tenth the cost of competitors’ tubs and production is six cars a day, up from two a week with the previous approach. An Aventador still costs about $400,000, though. These manufacturing techniques also made it possible to use more carbon fiber in the company’s “entry level” 2015 model, the $240,000 Huracan. A Huracan engine cover hangs in the Seattle museum, near a forged carbon-fiber cockpit from a $4 million, limited-edition Veneno. Feraboli’s UW lab, emblazoned with Lamborghini’s crouching bull logo, added some European glam to the stately aeronautical-engineering building. But the quasi-industrial endeavor didn’t sit well with some academics, and Feraboli had a falling out and left the school in 2013. The lab also produces scale models of current Lamborghinis that the company sells for $9,000 to $14,000. To continue the lab’s research and outreach, Feraboli and Lamborghini moved it to Interbay last year. Feraboli also started his own venture, Gemini Composites, to consult with Lamborghini and other companies on products. Half the building is a production facility used to prototype, test and produce carbon-fiber products. It includes 3-D printers, factory robots and even a cannon used to test the impact-resistance of parts. 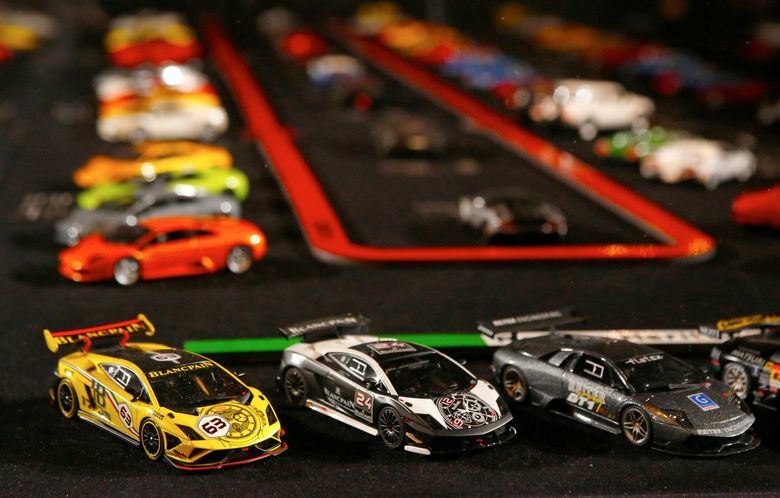 It also produces scale models of current Lamborghinis that the company sells for $9,000 to $14,000. “They’re not for the everyday collector,” Feraboli said. Feraboli also is working on a sculpture of the Lamborghini bull that will be erected at the headquarters in Italy. It will look a bit like the bull sculpture on Wall Street but instead of bronze it will be made of forged carbon-fiber material. The other half of the Interbay building houses the museum and a small conference center, where Lamborghini’s expertise in composite materials is shared with engineers and executives from companies. They’ll pay $700 to $900 per day for sessions lasting one to five days. Sessions move between the conference center and production center, and are fueled by endless cups of espresso provided by Feraboli and his five employees. Lamborghini will also send new employees from Italy to spend a week or so at the lab. With the company expanding to meet growing demand for its cars, especially in markets like China and the Middle East, it could send 15 or more employees a year to Seattle for the training. Jim Kastama, a former state legislator turned business consultant, is helping coordinate the educational sessions. He said the facility could also be used for some K-12 programs. Details for the museum are still being worked out. The current plan is to let people visit free, after making reservations. But if it gets too busy, it may charge $10 or $15 to limit crowds and cover costs. Kastama said most people probably have no idea that this is where Lamborghini’s doing advanced carbon-fiber research. “Of all the places in the world — this is the place,” he said.